From reserved women seats of Punjab Province PML-N got 57 seats, PTI got 5, PML-Q got 2 while Peoples Party and PML-Zia got 1 seat each. From reserved seats for minorities PML-N got 7 and PTI got 1 seat. From Sindh Province reserved seats for women Peoples Party got 16, MQM got 9, PML-F got 2 and PTI and PML-N got 1 seat each. For minority seats Peoples Party got 5, MQM got 3 and PML-F got 1 seat. From Khyber Pukhtunkhwa Province reserved seats for women Pakistan Tehreek Insaf got 10, JUI (F) got 3 seats, PML-N got 3 seats, Qaumi Watan Party got 2 seats, Jamaat Islami, ANP, Peoples Party and Awami Jamhori Ittehad got one one seat each. From reserved seats of minorities PTI, JUI(F) and PML-N got one one seat each. From Province Baluchistan reserved seats of women PML-N got 3, Pukhtunkhwa Milli Awami Party got 3, National Party and JUI-F got 2, 2 seats each while PML-Q got one seat. 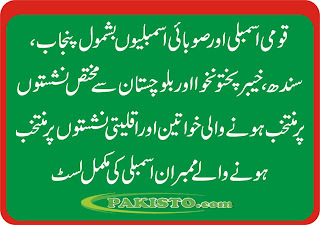 From reserved seats of minorities PML-N got one, Pukhtunkhwa Milli Awami Party and National Party got one one seat each.